THE “MUST HAVE” BOOK FOR YOUNG PEOPLE IN 2016. 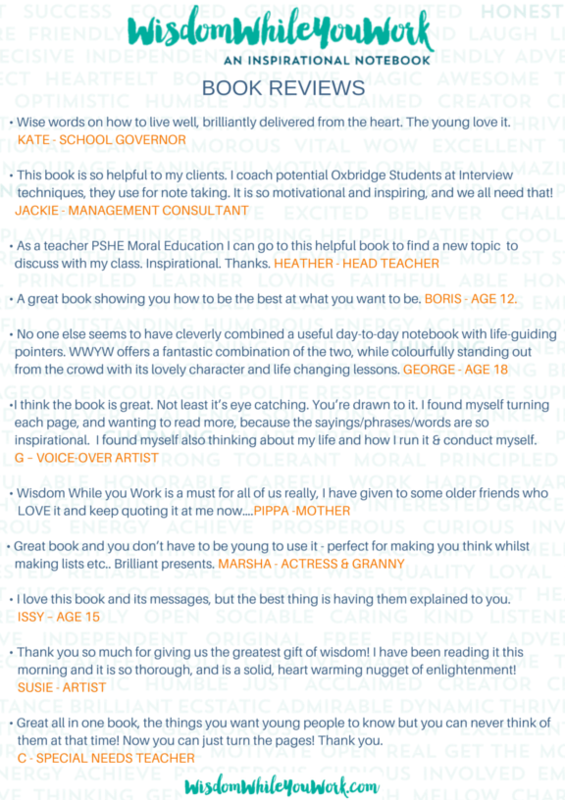 I am hoping you could run a piece about the huge interest my book is creating with parents, teachers and the young. It is a positive and upbeat book about communication, understanding and core values. 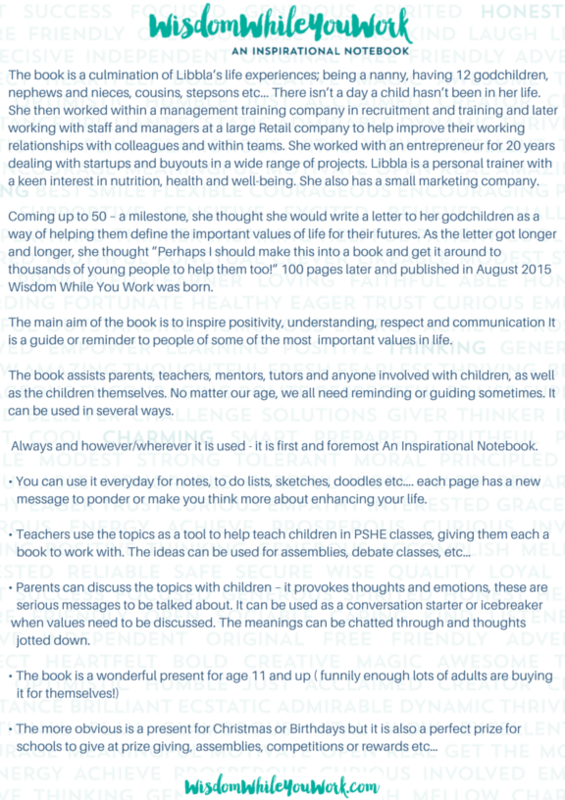 The book is a moral guide with help and suggestions for young people. It is a notebook they can use every day. 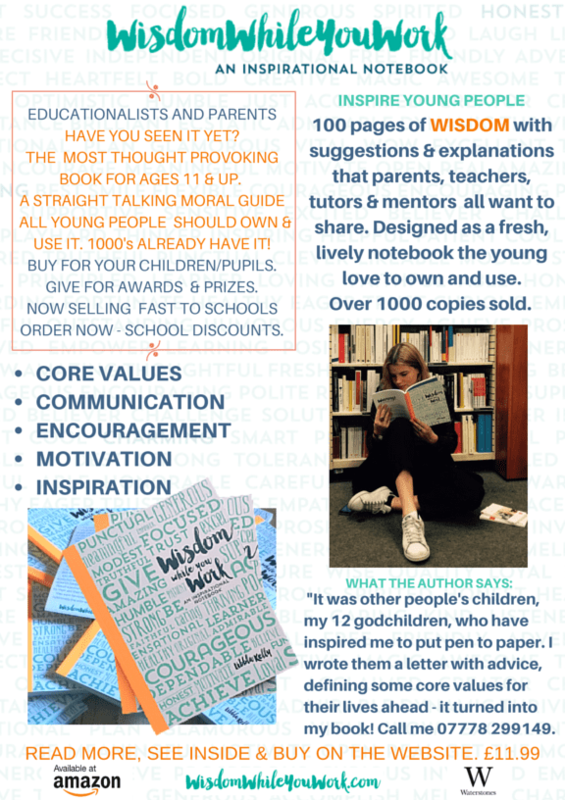 Wisdom While You Work started off as a letter to my godchildren and ended up as a book I have had to reprint already! The thrilling part of the story is that schools are now buying it! This is a direct result of me attending the Schools fair in London in November. Teachers are using it as a notebook in PSHE classes, pastoral care, for assemblies, rewards and prize giving. It has also been bought by rehab clinics, doctors, social-clubs and is perfect wherever young people need motivation, positivity and to understand more about core values. In 2016 my plan is to market it to every school in the country, book clubs, youth clubs, anywhere young people are gathering. There are special discounts for schools and larger orders. I am also looking to team up with a charity. I really feel it is a piece of good news in this difficult time the world is having. I attach some more pieces about it for your information. Scroll down. I would be really pleased if you can let me know what you think? I look forward to hearing from you.